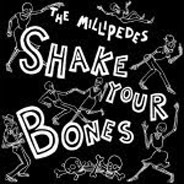 Box sets are probably a bad financial deal in the last days of the music biz but a box is the perfect home for a collection of impressive 7” singles by the Millipedes. The pseudonymous band (guitarist “Rocking Oliver D’World” has a name of cryptic genius) is a veritable Steel City supergroup, comprising former members of the Long Blondes, Smokers Die Younger, Thee Motherfuckers and Velodrome 2000. Their horror-infected garage rock and sleazy r’n’b – served in 10 bites across the three records (the CD version adds a bonus song) – bring to mind the fuzztoned, organ-driven mayhem of ? And The Mysterians and the saucy soul of Andre Williams. There’s something beautifully raw and savage about the wailing organ and reverby guitars (Link Wray risen from his grave) but the Millipedes keep one (severed) foot in the pop camp with ‘Hey Boy’ echoing Comet Gain’s racing indiepop. The distinctively odd ‘Do Do Do Dare Dare Dare’ meanwhile might best be described as Satanic-ska. The Millipedes have fun with the b-movie ideas of alien invasion and lycanthropy matrimony but never ham it up like, say, Zombina and the Skeletones, who were pure pork. Single one is led by the insane cowboy-garage hoedown of ‘Make Something Happen’. The awesome second single ‘Ooh-Wee’ is relentless rock’n’roll guaranteed to get Teds, heads and indie-wet-the-beds on the dancefloor while the third offering ‘Humans of Earth (We Salute You)’ is lunatic bubblegum pop. They cleverly balance the sassy come-on of ‘Shake Your Bones’ with the Irma Thomas-style ballad ‘Never Wanted to Go’ and show off their love of great rock’n’roll with obvious nods to ‘Shakin All Over’, ‘Helter Skelter’ and Wipeout’. I can’t tell the A-sides from the B-sides, which makes the whole thing essential. I make no bones about it.